Anyone who’s moved house is probably familiar with the age old thought that it’s one of the most stressful experiences we’ll ever have. This popular saying isn’t really borne out by research, but clearly it strikes enough of a chord to have stuck around. Moreover, the prevalence of articles sharing tips on how to reduce anxiety indicates we humans aren’t huge fans of the relocating process. But if all that sorting and packing and change is taking a toll on you, what might it be doing to your beloved animal companions? Luckily, animal experts have a number of recommendations for how owners can keep pets safe and happy while undertaking a move, and hopefully prevent any Homeward-Bound scenarios as well. 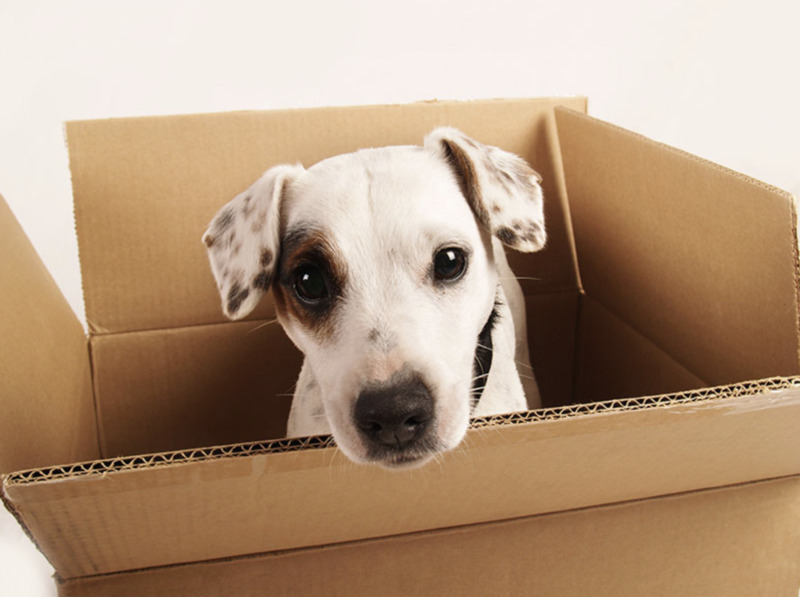 Before you actually get to the part where you’re packing and labelling cardboard boxes, it’s a good idea to make sure your new home is pet-friendly. Walk through the local area, make sure there are dog parks or beaches where pooches can get their exercise, and thoroughly assess the property you’re moving to to ensure it’s animal-proof. Make sure that gates can shut properly and yards are secure to prevent wayward pets escaping. Maybe even take dogs along to give them a chance to sniff out the new neighbourhood. Sonia Trichter, president of Tweed Shire rehoming centre Friends of the Pound, suggests familiarising animals with your new house as soon as possible. If you’re a pet owner who’s ever packed so much as a duffel bag for a weekend away, you’ll know how dogs and cats will watch your every move. Companion animals can detect changes in their environment, and are attuned to signs that their humans might be leaving them. While packing up an entire house, it’s best to reassure pets by keeping their routines as normal as possible. Continue to feed and walk them at the same time as usual, and make sure they have some of their favourite toys and treats around. Save packing these things for moving day, so dogs and cats can be comforted by them as long as possible. If you have a particularly neurotic animal, a prescription from the vet could be in order. For less extreme cases of stress, appeasing pheromone diffusers emit scents that can relax pets. Feliway is odourless to people and other animals, but mimics a pheromone cats leave when feeling comfortable. For canines, Adaptil smells similar to the scent a mother dog releases to her litter and can help reduce fear. Both products are available at Petbarn. When it’s time to move, Trichter recommends keeping your pets with you wherever possible, rather than boarding them at a kennel or cattery. If removalists will be coming and going through the house, restrict pets to a closed room. Crates can also be helpful, both as a safe space an animal can go to if stressed, and as a way to securely transport them. Dr Walker says due to their territorial nature, cats can find moving house especially difficult. Congratulations, you survived the move! But before you start arranging furniture and hanging artwork, spend time helping pets acclimatise. Cats should initially be confined to one room, and then gradually introduced to other surroundings. Trichter, who has plenty of experience settling rehomed cats, says this is a good method to help them adjust. Walker recommends hiding small pieces of dry food around the house to encourage cats to explore at their own pace. “RSPCA Victoria encourages owners to keep their cat indoors, but if you choose to let them outside, do so very slowly to lessen the risk of them becoming lost or running away,” she says. Maintain your dog’s routines, and visit some of their favourite places for the first few weeks if possible. Set rules early on so they know where they’re allowed and where to eat and sleep, and use positive reinforcement – pats, praise and treats – to make them feel happy and relaxed. And Dr Walker has one more crucial tip. “Be sure to update your dog or cat’s council registration so that if they do escape and go missing, you will be quickly reunited. Update your dog or cat’s identification tag with any new details, too. And don’t forget to update your contact details on your pet's microchip register".